Doctor Ben's Scale model corrugated and standing-seam roofing materials are manufactured using quality aluminum. Doctor Ben's Contest Proven Instructional Techniques included in this purchase leads you through the step-by-step process to apply finish & weathering products to solve the many of the questions you have for the fastest, easiest way to apply corrugated & standing seam material as well as a quick and easy technique to apply finishes and weathering. You are going to want to use Doctor Ben's Super Sticky Adhesive #2924 to apply this material. Applying roofing/siding has NEVER been easier. Coloring & Weathering techniques are recommended using Doctor Ben's Weathering & Stain Products! SEE Below! 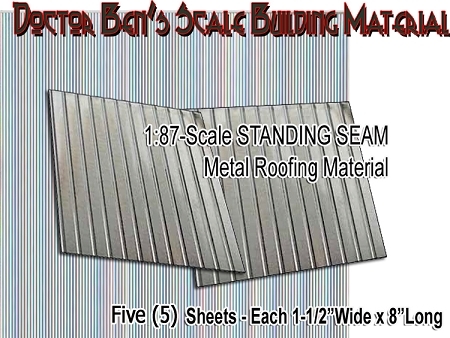 Would you like to download & print out the Doctor Ben's Standing Seam/Corrugated Roofing Instructions? CLICK HERE!